In order to quit the "slow" ripple carry chain will be necessary to use logic which predict the carry for each stage instead of waiting for the carry to propagate through the chain. 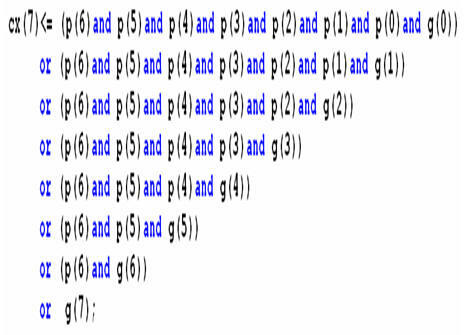 Each two bit pairs can either Generate or Propagate a Carry. The Carry Propagation will cost a Xor-gate. By nature will it cost more and more logic to "foresee" the Carry when moving toward more significant bits. Note! however that some gates with up to 32 input. Extract from the solution below. Please note generate statements which produces all the Propagate and Generate components. A "Lazy" hardware designer would properly prefer using the time to figure out code which could do job automatically. The process at the left seems to work ok and generates code for a 8-bit adder. Its easy to modify to a 32-bit adder as well and in fact I tried as well. Just to see the hardware cost (should be huge in FPGA) and try a simulation. But I learned something about HDL, synthesise tool and FPGA structures as well. This was the Hardware cost for a 32-bit Ripple Carry Adder. This is the Hardware cost for a 32-bit Carry Lookahead Adder. Hard to find the difference and the simulation also shows that no matter how I try to describe the Hardware Structure will the synthesise tool recognize an adder but it refuses to implement it. Exercise: Try to implement a 8-bit Carry Lookahead Adder with a Schematic Diagram.